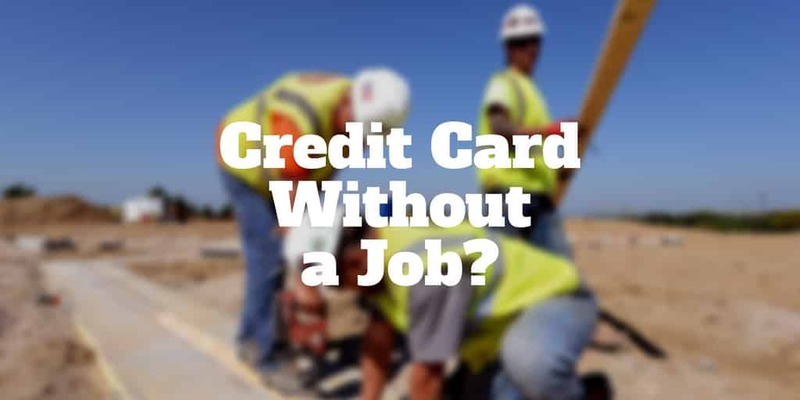 Home › Credit Cards › Can You Get A Credit Card Without A Job? Can You Get A Credit Card Without A Job? When you are job hunting, paying your bills can be a struggle. Without a nest-egg to dip into or a trust fund to pay your way, a credit card is an obvious choice. But can you get a credit card without a job? It turns out that credit card companies are not so worried about whether you are employed as they are concerned about your income and debt levels. The good news is that means you can get a credit card even if you don’t have a paid position. So how do you boost your chances of getting a credit card with no job or income? No Job, No Problem – But Do You Have Too Much Debt? When you apply for a credit card you will be asked to state your total annual income. Even if you don’t earn a fixed salary, you can legitimately claim income from other sources. Even if you have no job, you are permitted to state income to which you have reasonable access. For example, married couples with a joint bank account could reasonably list the income of a partner. That means even if you don’t have a job or any income, you could still be approved for a credit card. However, income is not the only criterion banks use to evaluate your creditworthiness and set credit limits. The amount of debt you are saddled with is a key factor used during the approval process too. And here’s what you need to know about how debt relates to the likelihood of being approved for a credit card. But Do You Have Too Much Debt? Credit card issuers care about your income but they also emphasize how much debt you owe when evaluating your creditworthiness. An applicant with $100,000 of debt may have no problem receiving approval if they have income of $1,000,000. But an applicant with no income and the same amount of debt could struggle to get a credit card. A key ratio credit card companies use to make approval decisions is the debt-to-income ratio of an applicant. For example, if your mortgage debt payments are $2,500 per month but your income is $1,000 per month, your debt-to-income ratio is 2.5. If you are struggling to keep up with interest payments on student loans, personal loans, auto loans, or other credit card debt, a 0% Balance Transfer card may be able to to ease the financial strains, at least for a limited time. Discover-It® and Chase Freedom both offer credit cards that could help you lower your interest rates to zero for a certain time period. If you are in job-seeking mode and need to batten down the hatches on monthly expenses, these cards may just fit the bill. If you have no job, you are still eligible to apply for a credit card and may boost your chances of approval by adding a co-signer to the application. Applying for a credit card with someone else can be a double-edged sword. On the one hand, you benefit by being able to cite their income. On the other hand, you run the risk of not receiving an approval if they have poor credit. Before asking a friend or loved one to become a co-signer, have a direct conversation with them to better understand their creditworthiness. Equally, they will need to trust that you will pay your credit card bills on time and not ratchet up a lot of credit card debt because they are on the hook if you can’t pay. Another option is to become an authorized user which gives you the right to use someone else’s credit card. If Auntie Mary kindly adds you as an authorized user to her Chase Sapphire Reserve credit card, you are permitted to swipe it to buy things but you are legally free from the obligation to make payments. While parents may commonly add children who are in college as authorized users, it is a big request of a loved one to add you when you have no job because they take on all the responsibility of paying the bills and need to trust you won’t pile on credit card debt by jetting off on first class flights to Bermuda and the Maldives for beach vacations! If you have no job and are considering applying for a credit card, a personal loan may be a good alternative to credit card debt. Borrowers with excellent credit scores could look to SoFi personal loans as an option. Another possibility is to visit your local credit union to enquire what personal loans they offer. You cannot find personal loans from Chase or many other big banks, so a credit union may well be your best bet. If you lack the income to qualify for a regular credit card, a secured credit card could be a solid alternative provided you have some savings. Secured credit cards require you to deposit money which in turn acts as your credit limit. It is a way to build up your credit score by making timely payments until you are eligible to be approved for a regular credit card. However, you must make those payments otherwise the upfront deposit will be used and may ultimately be forfeited if needed to pay the bills. Secured credit cards are a way for credit card providers to take little to no risk while offering you a way to boost your credit score. If you are struggling to receive approval because you have no job or poor credit, start by visiting MyFICO to understand what steps you can take to improve your creditworthiness. Paying your balances in full and your bills on time goes along way towards boosting your credit score. Are you clear about how to get a credit card when unemployed? Let us know if you have found other creative ways to pay your bills without having a job. >> Why Was My Credit Card Declined? ‹ Can You Buy A House With A Credit Card?